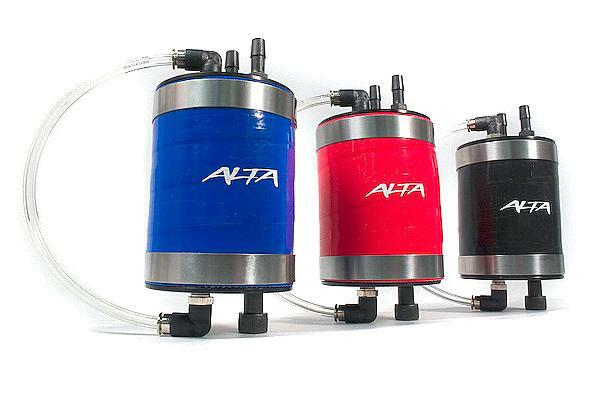 Alta Oil Catch Can MINI - Dezod Motorsports Inc - Home of the automotive performance enthusiast since 2002. Supercharged engines are prone to accumulation of an oil sludge mixture forming inside the intake tract. This is a result of crankcase pressure and inefficient combustion. While this condition is normal it is a hindrance to making higher horsepower and increasing engine longevity. Oil vapor is forced out of the cylinder head and redirected through vacuum hoses into the intake stream. The oil vapor then condenses onto the inside surfaces in the intake system. This is especially prominent in the intercooler core. A thin film of oil coating the inside of the intercooler will insulate the air to air exchange and lower the ability of the intercooler to cool the intake air charge. The ALTA Performance catch can will hold this oily byproduct while removing it from suspension in the intake air stream. Horsepower is increased by eliminating the engines current requirement to try and reburn this relatively noncombustible oil. Engine longevity is lengthen due to this oil not having the ability to gum up the valve train, supercharger, and various other moving parts and sensors. Intercooler efficiency is also increased. Valuable for daily driven street cars but truly a must have for track cars and those cars with our high boost supercharger pulley. Easy to clean, empty and maintain. A built in fluid site gauge will visually show when to empty the catch can. The ALTA Catch can body is constructed from 3 ply high temperature silicone. Included vacuum hoses are made from extruded silicone composite and color matched to the body of the catch can. All hose connectors are constructed of fiberglass reinforced ABS plastic and are rated to over 400 degrees.